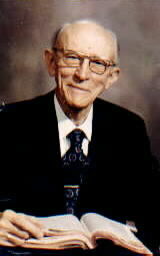 Ray Van Neste, professor of Christian Studies at Union University in Jackson, TN, has posted a pertinent quote from the late great Vance Havner on the Christian ministry made while reflecting on Elijah’s confrontation with the prophets of Baal in 1 Kings 18. To read this quote and many other great thoughts and quotes on pastoral ministry check out Ray’s blog, Oversight of Souls. Excellent and prophetic glimpse at the current landscape of evangelicalism. Perhaps if the SBC were to inagurate this year’s convention with the reading of this quote, it might set the stage for the Fall of the Revival Fires we all “Claim” to be praying for. I do fear what would be the magnitude of the Tsunami that it would require to drench the altar that has been contaminated by our carnal concepts of ministry. Oh for God to raise up a generation of Havners. Thanks for the link Steve. I like the idea of starting the SBC with this quote! Shall I secure a microphone?